Sometimes God's first chosen people thought they were the only people God could ever favor. This is a story about pagan people who turn to God, and how God used a reluctant servant to bring that about. At the time he wrote this early letter, Saint Paul, like most Christians then, believed Jesus was soon to return in glory, and everything would change. This is some of his advice on getting prepared. In the earliest gospel, we have heard about John the Baptist deferring to Jesus, a voice from heaven declaring Jesus' favor, Jesus' fasting and his temptation. Now we are ready to hear his first public words. The Liturgical Setting: Over the Sundays of ordinary time this year, we'll read consecutive passages from the Gospel of Mark. In today's passage, Jesus calls several disciples, who follow him immediately. The first reading tells the story of Jonah's similar effect in Nineveh. As a conscientious liturgical minister, you'll want to know the larger picture, larger than your readings, that is, so read the day's gospel, Mark 1:14-20. The Literary Background: Jonah's apparently easy success in chapter 3 is quite ironic because of what has gone before. Of course the first thing we think of when we hear his name is that whale. How did Jonah come to spend three days and three nights in the belly of that beast? Well, chapter 1 of Jonah starts with the Lord calling the man to go to Nineveh and prophesy. Jonah, perhaps out of fear or disbelief that the Ninevites could respond to his preaching, runs the other way and sails on a ship. A terrible storm threatens the ship, and the others aboard surmise that God is coming after Jonah, so they throw him overboard. That's when the whale gets him, at the beginning of chapter 2. Jonah prays, the whale spits him up, and, in chapter 3, God directs Jonah a second time to go to Nineveh and preach repentance. In the fourth chapter, Jonah expresses bitter disappointment that Nineveh repented and God did not destroy the city! God rebukes Jonah for his smallness of vision, and the story ends. Read it all here. The Historical Situation: The book of Jonah was actually written after the Jews' exile. Some of them were quite nationalistic, and filled with a smug sense of superiority over other nations. Like Jonah, they wished God would destroy the nations perceived as enemies. The story of Jonah is meant to rebuke their smallness of vision, and teach them that God has care for other peoples as well as for them. Proclaiming It: Even if your listeners won't know all that background, you can bring out the truth that God can evoke repentance even from unlikely people. In the middle sentences, use your tone of voice to express this astonishing truth. Stress how large is the city ("It took three days to go through it. "), that Jonah "had gone but a single day's walk," that Jonah's message was vengeance: "Nineveh shall be destroyed!" and that all of the Ninevites repented, "all of them, great and small." Then pause before the final sentence that tells God's merciful response. Deliver that soberly and gratefully. Corinth was a bawdy seaport, where visitors and the locals who would accommodate them had a typical seaport's set of ethics. Corinth, while not an Athens, was a center of philosophical and religious ferment; new and bizarre ideas were constantly in the air. Christianity seemed to be at least an ambitious development of old Judaism, if not an entirely new religion, with plenty of yet unanswered questions. Christians believed that Jesus was soon to return in glory, bringing the world to an end. That changes your long-term planning, if not everything else. For all these reasons, Paul spends all of chapter 7 on marriage and sexual morality. If you read the whole chapter, you'll see that the Lectionary's three verses are the the most tame. Dan Nelson quotes a scholar with interesting ideas about the meaning of "those weeping ... rejoicing ... [and] buying ..." Even if you interpret Paul's directives to the married, the weepers, rejoicers, and buyers more generically, the point stands: The imminent coming of Christ again in glory changes everything. Proclaiming It: The reading is bracketed with statements about the end of the world. Be sure to emphasize those. I say this not because I anticipate the coming of the Lord in glory immediately, but because that anticipation, however immediate or remote, is part of who we are as Christians. 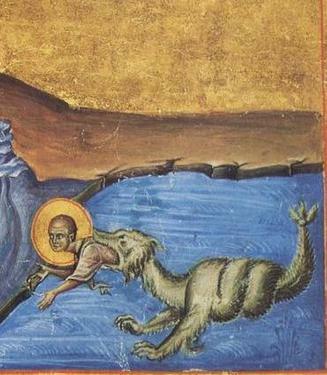 Jonah (detail), from the Menologion of Basil II, an illuminated manuscript designed as a church calendar or Eastern Orthodox Church service book that was compiled c. 1000 AD, for the Byzantine Emperor Basil II. It currently resides in the Vatican Library. Jonah is popularly known primarily for his sojourn in the belly of the whale. But we should remember him for vastly underestimating the power of the Word of God to bring about change in peoples' hearts. Caveat lector. See the complete illumination and more information. 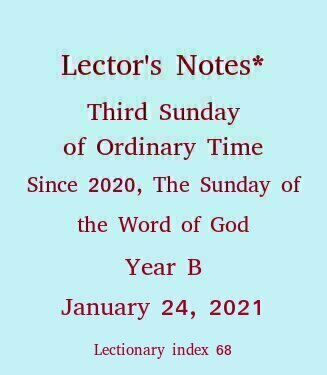 The first Lector's Notes appeared on the Web January 23, 1999, for the Third Sunday of Ordinary Time in liturgical year A. The website lectorprep.org appeared in November, 2002. It now serves pages covering 180 of the Sundays and feasts in the three-year liturgical cycle. Volunteers have translated some Notes pages into Spanish. Most Notes pages are now mobile-friendly.